Typically there is a stigma associated with buying pre-owned. However, this negativity does not apply to purchasing a used diesel generator. In actuality, most professionals often prefer to buying used to buying brand new. While this may seem unusual, it’s for good reasons! Yes, you can save money by scooping up a pre-owned diesel generator – about 30-50 percent in most cases -but there are more benefits than just the savings! Like a fine bottle of wine, used diesel generators get better with age. This is common with most diesel-powered machines. It takes an extensive amount of operation time before a diesel generator needs repairs or replacement (about 10,000 hours). This being said, buyers do not have to worry that they are sacrificing quality when buying a used diesel generator. Often people are concerned with buying used because they think the product will not work as well or as long as a brand new unit. This simply isn’t true! Buyers of a used diesel generator can have peace of mind that their purchase will last. When these diesel generators are put back on the market after being owned by another company, they are put through thorough inspections and tests. After a unit is received, expert technicians start inspecting and a servicing every piece and part. All components must be in tip-top shape. If not, they will be repaired or replaced. Once the unit is looked over and fixed up, mechanics put it through a lengthy testing process. These series of tests must be passed for a used diesel generator unit to end up on the market. Just because it’s older doesn’t mean it can’t still look good! After inspections and tests, used diesel generators are treated to some TLC. Units are completely cleaned, wiping away years of dirt and grime. After a cleaning most units receive a new paint job, leaving them looking like new. For those in the market for a used diesel generator, turn your sights toward Depco Power Systems. Since 1991, we have supplied customers with top-notch generators, engines, marine engines, power units, and marine transmissions. Our pre-owned units are inspected with a fine tooth comb, repaired, restlessly tested, and expertly cleaned before we advertise them as for sale. Our eight-step process, “The Depco Way,” is tried and true for selling high-quality products that our customers trust. In addition to rigorous service and maintenance, Depco offers delivery! Used diesel generators won’t fit in a flat-rate box from the post office, so Depco handles delivery all around the world. We are equipped to process and ship orders quickly. Buying a used diesel generator is advantageous to you – and cutting costs is just the start! If you’re interested in learning more about Depco’s used diesel generators, or our process, please contact us today! 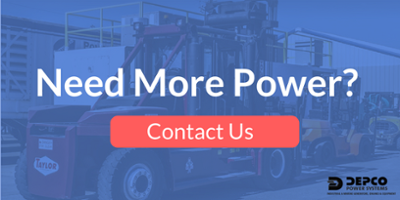 We want to go beyond just discussing a single generator at a certain price point; let’s talk more about your entire operation, your long-term equipment needs, and how you wish to balance investment and performance priorities.